Darcelle & Justin are Fun In the Sun Weddings’ newest newlyweds! Gentlemen, never underestimate the power of a great Wing Man when it comes to finding Mrs. Right. This bride and groom met in the most natural way: In a bar. Thankfully for them both, Justin had his Wing Man, or Wing Woman rather, with him that night. She marched right up to Darcelle and made the necessary introductions. And the rest is history. Five months into their relationship, Justin brought Darcelle as his date to a destination wedding in Riviera Maya. It was there that they fell in love with each other and with the idea of someday having a destination wedding of their own. 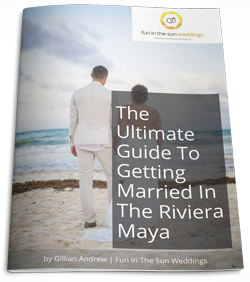 A vacation with family and friends, and the comfort that comes from all the guests getting to know each other before the wedding day was exactly what they wanted for their loved ones. When Justin was ready to propose, he enlisted the help of their closest friends, under the guise of going snow tubing one night. They led her to a campfire where he was waiting with their family and friends, and she was so surprised that she immediately burst into tears. 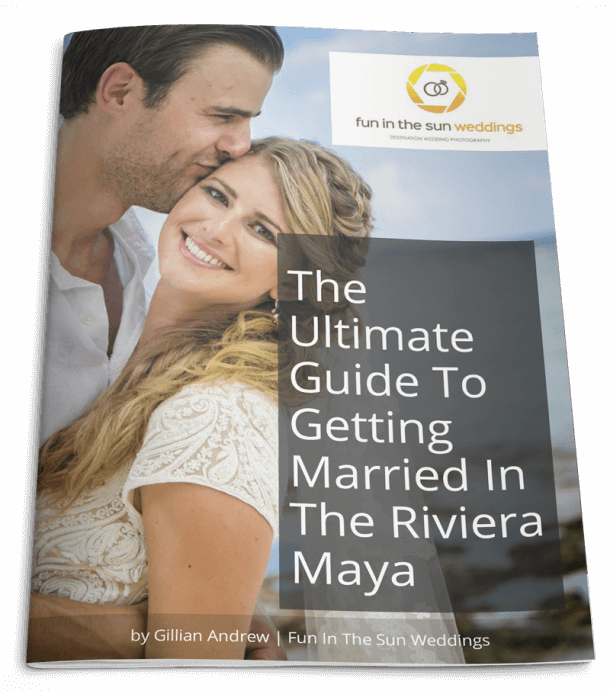 When planning their destination wedding at the Ocean Riviera Paradise The bride and groom were often asked, “What happens if it rains?” They chose not to worry about it, until the night before their wedding when a thunderstorm rolled in. In the morning, they saw the backup location and decided instead to trust their guts and stick with their wedding on the beach. Luckily the rain stopped and the sun peeked out moments before their ceremony. Everything was magical! The bride considered her bridesmaids comfort in the heat by choosing their stunning light floral bridesmaids dresses and sandals. It was important to the bride and groom that all of their wedding guests have fun, and that their wedding be filled with love and special memories. Their favorite moment of the day? It was sitting at the Sweetheart table, under twinkle lights, surrounded by tiki torches and the waves crashing behind them. They took a moment to absorb that everyone they love was there to celebrate them. Darcelle and Justin, it has been such a pleasure sharing your wedding adventure. We wish you all the happiness in the world as you start this next chapter of your lives together. Congratulations! Want to know more about the Ocean Riviera Paradise? Read unbiased reviews on Tripadvisor here. Justin and I had so much with Marc and your team on our wedding day. It was just amazing!